The University of Massachusetts School of Law has launched what it is calling an incubator designed to help new lawyers start their careers while serving modest-income clients who might not otherwise afford a lawyer. 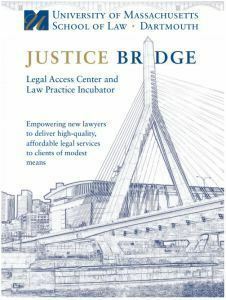 Justice Bridge is described as a legal access center and law practice incubator that will help enable new lawyers to deliver high-quality, affordable legal services to clients of modest means. “The purpose of Justice Bridge is to match the 85 percent of litigants appearing in court every day without lawyers with the recent law school graduates who don’t have clients,” said program founder Deborah Ramirez, a professor at Northeastern University School of Law. Shrinking employment opportunities for recent graduates under existing law firm structures. The legal system’s growing inability to serve consumers of modest means who cannot afford high hourly rates but nonetheless make too much money to qualify for pro bono legal assistance. To help address those dual challenges, Justice Bridge will provide new lawyers with resources, technology tools, training and mentorship to enable them to provide quality legal services. Lawyers will offer services in areas such as family law, housing, probate, employment, consumer law and immigration. Legal fees will be set on a sliding scale, averaging $50 an hour and not exceeding $100 an hour, the program’s executive director, Leonard F. Zandrow, told the Boston Business Journal. Attorneys who work in the incubator are expected to earn about $50,000 a year. Lawyers must apply to participate in the program. As part of the application, they will be asked to include a business plan outlining their legal practice goals. They will be expected to continue to develop and refine their plans as they participate in the program. After two years, they will go off on their own. For now, the program has launched with nine recent graduates working on a six-month pilot basis. After the pilot concludes, attorneys in the program will pay a monthly membership fee of $500, for which they will get a furnished office in either downtown Boston or New Bedford, plus access to referrals, mentors and other resources. They will also be required to incorporate as a PC and purchase their own malpractice insurance.